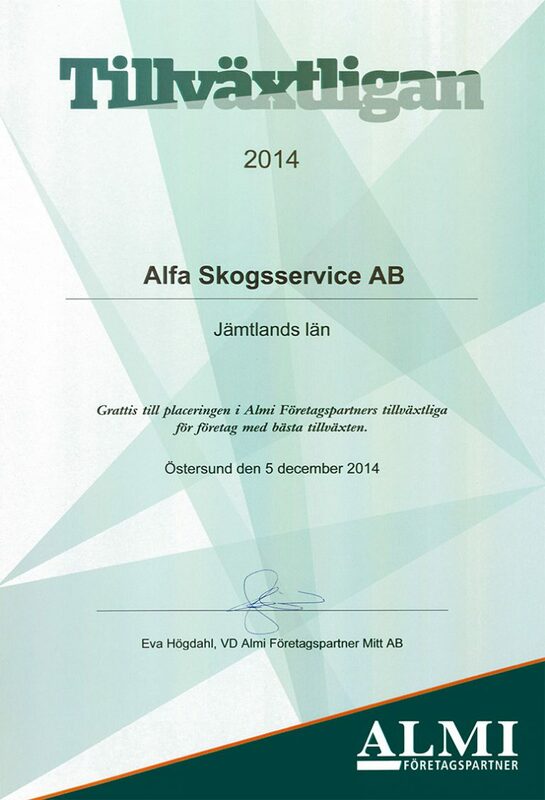 Let us introduce ALFA Skogsservice AB, one of the major companies within Swedish forestry. We see a potential development in almost all our fields and we never stand still. Digital solutions, developing people, sustainability, technical development, flexible logistic and efficient production with new and smart solutions. These are just a few of the key factors that define us as a company. Since the beginning in 2011, the company has grown quickly but without losing control and focus towards the things we do best. 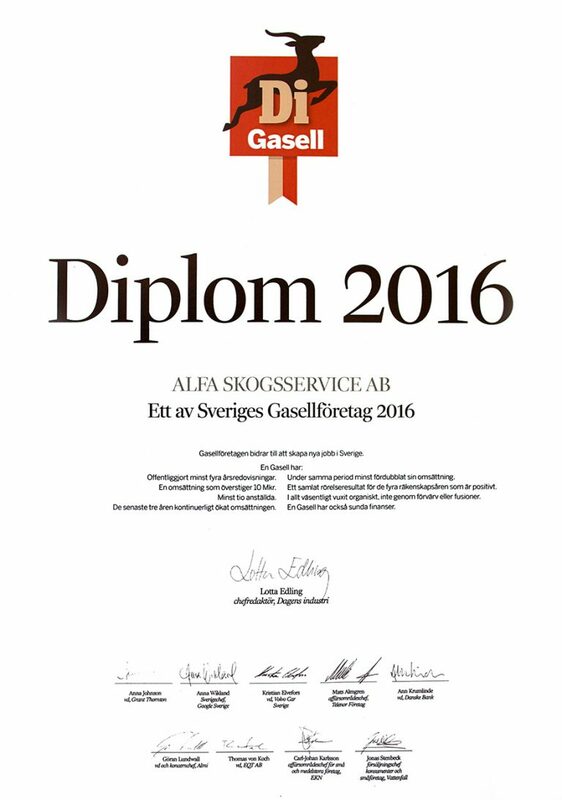 As a proof, ALFA was awarded the price “Gasellföretag 2016” that the well-known paper Dagens Industri awards every year. 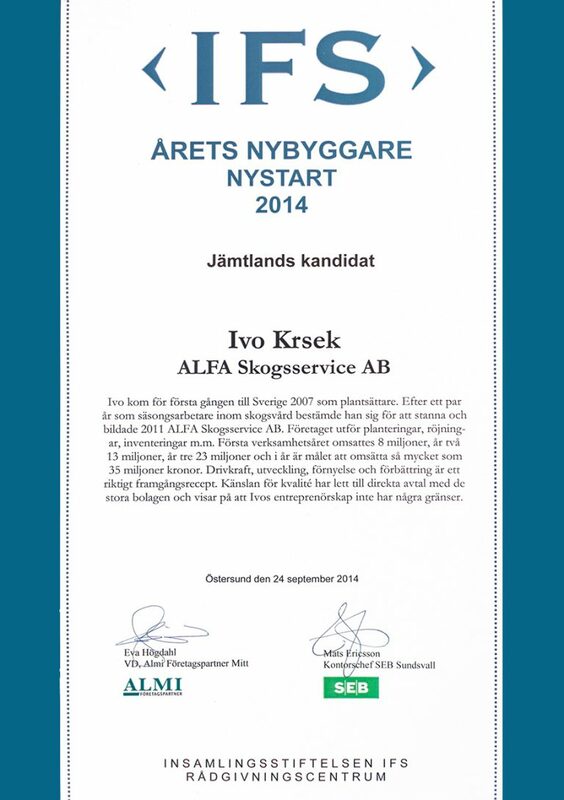 The owner of ALFA has also been awarded “Settler of the year 2014” in Jämtland. We are not better than our last project. Fair terms for our employees and to our customers come natural to us. We care about You and Your forest. We care about our environment and take responsibility for our community. It comes natural for us to be involved in different forums and organizations within the industry. If You are looking for a supplier that strives forward and takes pride in doing a great work, then You have come to the right place. We want to be a role model and enhance the status of the forest work. The quality of the performed work is the most important to us. You can count on that. Our quality concept contains accuracy of details and customer requests. Everybody is different and that is all good. We always deliver on time, follow up on our results and give You as a customer a warrant of performed work. We are Your forests best friend. Our company is geographically divided in two independent regions – North and South. The office for the northern region is in Hammarstrand in eastern Jämtland. There are also three local offices in Östavall, Timrå, and Åsele. 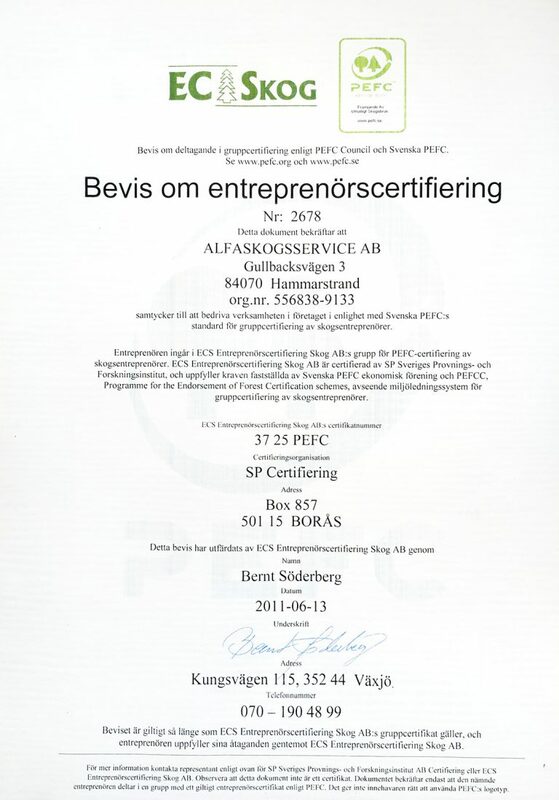 The office for the southern region and the head office for the company is in Jönköping. Now, we are in an exciting phase of establishing a third region, Middle. Please help us establish us in Dalarna, Hälsingland, Gästrikland, Uppland, Västmanland, Närke and Värmland, and we will help You and You forest. We guarantee You will be satisfied. Our different geographic regions give You as our customer plenty of benefits. You can hire a nationwide entrepreneur with great resources, and at the same time You get the service of a flexible organization with local connection. Our skilled project manager and site managers will find a smart and optimal solutions just for You. We always aim to fulfill Your and Your forest’s needs. The ultimate award really is that our employees and our customers come back year after year and we are having fun together!